What is M.2? Is it the same as NGFF? M.2 was developed by the PCI-SIG and SATA-IO standards organizations and is defined in the PCI-SIG M.2 and the SATA Rev. 3.2 specifications. It was originally called the Next Generation Form Factor (NGFF), and then formally renamed to M.2 in 2013. Many people still refer to M.2 as NGFF. The M.2 small form factor applies to many add-in card types, such as Wi-Fi, Bluetooth, satellite navigation, Near Field Communication (NFC), digital radio, Wireless Gigabit Alliance (WiGig), Wireless WAN (WWAN), and Solid-State Drives (SSDs). 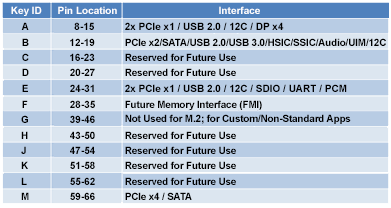 M.2 has a subset of specific form factors strictly for SSDs. Is an M.2 SSD the same as an mSATA SSD? M.2 2280 (above) compared to mSATA. Note the Keys (or notches) that will prevent them from being inserted into incompatible sockets. Why was the M.2 form factor created? The M.2 form factor was created to provide multiple options for small form factor cards, including SSDs. SSDs previously relied on the mSATA for the smallest form factor, but mSATA was unable to be scaled up to 1TB capacities at reasonable cost. The answer was the new M.2 specification that allows for different M.2 SSD card sizes and capacities. The M.2 specification allows system manufacturers to standardize on a common small form factor that can be extended to high capacities where needed. Why would I want to install an M.2 SSD? All M.2 SSDs flush-mount into M.2 sockets on system boards. The M.2 form factor introduces a path to higher performance via a smaller footprint and is the future path for SSD technological advancement.In addition, no power or data cables are needed making cable management unnecessary. Like mSATA SSDs, M.2 SSDs just plug into a socket and the physical installation is complete. In what systems do M.2 SSDs work? Motherboards using the recently released Intel z97 and AMD FX 990 chipsets support M.2 SATA and PCIe SSDs. In addition there are numerous notebooks already supporting the M.2 SSD. Please consult system specifications and user manual to check for compatibility before purchasing an M.2 SSD. Will this FAQ discuss all the different form factors for M.2? In this FAQ, we will strictly focus on the M.2 SSD form factor with a caution to readers: There are M.2 sockets in systems that are not compatible with M.2 SSDs. I’ve read M.2 comes in different dimensions, what are they? Why are there different lengths for M.2 SSDs? The different lengths enable different SSD drive capacities; the longer the drive, the more NAND Flash chips can be mounted on it, in addition to a controller and possibly a DRAM memory chip. The 2230 and 2242 lengths support 1-3 NAND Flash chips while the 2280 and 22110 support up to 8 NAND Flash chips, which can enable a 1TB SSD in the largest M.2 form factors. Socket space in the system board can limit the M.2 size: Some notebooks can support an M.2 for caching purposes, but only have a small space that will accommodate only a 2242 M.2 SSD (2230 M.2 SSDs are smaller still but not needed in most cases where 2242 M.2 SSDs will fit). For example, if an M.2 SSD is used as a Cache (With Intel® Smart Response Technology (SRT) software on Client systems) or small capacity OS boot drive in an Ultrabook or Chromebook, 2242 M.2 SSDs are commonly used.If the M.2 SSD is used as the primary drive in in either a notebook or desktop system, longer and higher-capacity 2280 M.2 SSDs are most commonly used. Kingston introduced 2280 SATA M.2 SSDs starting in June 2014 and will add different sizes as required by the market. What is the difference between M.2 SATA and M.2 PCIe SSDs? M.2 is the physical form factor.SATA and PCIe refer to the storage interface, the primary difference is performance and the protocol (language) spoken by the M.2 SSD. The M.2 spec was designed to accommodate both a SATA and PCIe interface for SSDs.M.2 SATA SSDs will use the same controller currently on typical 2.5 in SATA SSDs.M.2 PCIe SSDs will use a controller specifically designed to support the PCIe protocol. An M.2 SSD can only support one protocol, but some systems have M.2 sockets that can support either SATA or PCIe. Does an M.2 SSD support both SATA and PCIe? No. An M.2 SSD will support either SATA or PCIe, but not both at the same time. In addition, system board sockets will be designated by manufacturers to support either SATA, PCIe, or in some cases, both. It is important to check your system’s manual to verify which technologies are supported; in some motherboards, there can even be sockets that support both and some limited to either SATA or PCIe only. Are M.2 PCIe SSDs faster than M.2 SATA? The PCIe interface is faster, as the SATA 3.0 spec is limited to ~600MB/s maximum speed, while PCIe Gen 2 x2 lanes is capable of up to 1000MB/s and Gen 2 x4 lanes is capable of up to 2000MB/s. There is also a new PCIe Gen 3 technology that will become more common in 2015, with x4 speeds of up to 4000MB/s. Do I need a special driver to use M.2 SSDs? No, both SATA and PCIe M.2 SSDs will use the standard AHCI drivers built into the OS. However, you may need to enable the M.2 SSD in the system BIOS before being able to use it. Why would I need to enable my M.2 SSD within the BIOS? In certain cases, the M.2 SSD socket could share PCIe lanes or SATA ports with other devices on the motherboard. Please review your motherboard documentation for additional information as using both shared ports at the same time could disable one of the devices. Are M.2 SATA SSDs faster than regular 2.5-inch SATA or mSATA SSDs? Performance would likely be similar; it would also depend on the specific controller inside the host system that the SSDs were using as well as the internal layout and controller of each SSD. The SATA 3.0 specification supports up to 600MB/s whether in a 2.5-inch, mSATA or M.2 SSD form factors. What would happen if I connect a PCIe M.2 SSD to an SATA-only M.2 port or vice-versa? If the host system doesn’t support the PCIe protocol, the PCIe M.2 SSD will most likely not been seen by the BIOS and therefore would be incompatible with the system. Similarly, with an SATA M.2 SSD installed into a socket supporting PCIe M.2 SSDs only, the SATA M.2 SSD would not be usable. What would happen if I connect a PCIe x4 M.2 SSD to a port that only supports PCIe x2 speeds? What do the different module keys on M.2 SSD drives mean? Source: All About M.2 SSDs, SNIA, June 2014. The different key types are often labeled on or near the edge connector (or gold fingers) of the M.2 SSD and also on the M.2 socket. 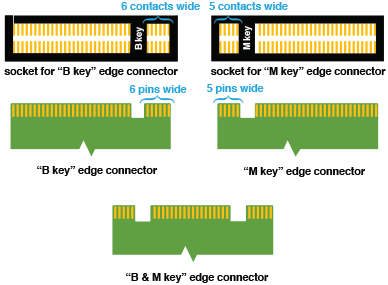 Note that B keyed M.2 SSDs have a different number of pins at the edge (6) vs. M keyed M.2 SSDs (5); this asymmetrical layout prevents users from reversing the M.2 SSDs and attempting to plug a B keyed M.2 SSD into an M keyed socket, and vice versa. What do the different keys mean? An M.2 SSD with the B-key edge connector can support SATA and/or PCIe protocol depending on your device, but can only support up to PCIe x2 performance (1000MB/s) on the PCIe bus. An M.2 SSD with the M-key edge connector can support SATA and/or PCIe protocol depending on your device, and can support up to PCIe x4 performance (2000MB/s) on the PCIe bus, provided that the host system also supports x4. An M.2 SSD with the B+M-key edge connector can support SATA and/or PCIe protocol depending on your device, but can only support up to x2 performance on the PCIe bus. What are incompatible M.2 and socket configurations? What is the benefit of having both the B+M key on an M.2 SSD? The B+M keys on an M.2 SSD allow for cross-compatibility on various motherboards as long as the appropriate SSDs protocol is supported (SATA or PCIe). Some motherboard host connectors may be designed only to accommodate M-key SSDs, while others may only accommodate B-key SSD. The B+M keys SSD was designed to address this issue; however, plugging in an M.2 SSD into a socket will not guarantee it will work, as that will depend on having a shared protocol between the M.2 SSD and the motherboard. What type of M.2 SSD host connectors will appear on motherboards? M.2 host connectors will either be B-key or M-key based. They may support both SATA and PCIe protocol. Conversely, they may only support one of the two protocols. If your SSD connector is a B+M key edge connector, it will physically fit either host connector, but you need to check the motherboard / system manufacturer’s specification to ensure protocol compatibility. How do I know which length M.2 SSDs my motherboard supports? You should always read the motherboard / system manufacturer’s information to confirm which lengths are supported, but many motherboards will support 2260, 2280 and 22110. Many motherboards will provide multiple retaining-screw offset, allowing a user to secure either a 2242, 2260, 2280, or even up to 22100 M.2 SSD. The amount of space on the motherboard will limit the size of M.2 SSDs that can be secured into the socket and used. When “socket 1, 2 or 3” is referenced, what does that mean? Different socket types are part of the M.2 Specification that calls for supporting specific device types within a given socket. Socket 2 supports both WWAN and SSDs? If a Socket 2 is available on a system for supporting a WWAN card and it is not used, it may be used for an M.2 SSD (typically a small form factor like 2242) if it is B keyed. SATA M.2 SSDs can be plugged into compatible WWAN connectors if the system board supports it. Typically, lower capacity 2242 M.2 SSDs will be used for caching purposes along with a 2.5-inch hard drive. Once again, it is important to consult your system’s documentation for M.2 support. No, M.2 SSDs were not designed to be hot-pluggable. Please install and remove M.2 SSDs when the system is powered off. What are Single-Sided and Double-Sided M/2 SSDs? For certain embedded applications where space is limited, the M.2 specifications provide for different thicknesses of M.2 SSDs – 3 different Single-Sided versions (S1, S2, and S3) and 5 Dual-Sided versions (D1, D2, D3, D4, and D5). Some platforms may have specific requirements due to limited space below their M.2 connector, as shown in the graphic below (Courtesy of LSI). Kingston M.2 SSDs conform to the Dual Sided M.2 specifications and will fit in the majority of system boards that accept Dual Sided M.2 SSDs; please consult with your sales representative if you require Single-Sided for specific embedded applications. The next-generation M.2 PCIe SSDs will shift from utilizing the legacy AHCI drivers built into Operating Systems today to using a new architecture using a new Non-Volatile Memory Express (NVMe) host interface. NVMe was designed from the ground up to natively support NAND Flash-based (and possibly future non-volatile memory) SSDs and deliver even greater performance levels. Preliminary industry testing has indicated performance levels of 4–6 times greater than SATA Rev. 3.0 SSDs today. It is expected to launch in 2015 in the Enterprise space first and then move on to Client systems. There are beta drivers present today in many operating systems as the industry sets up the ecosystem to launch NVMe SSDs.